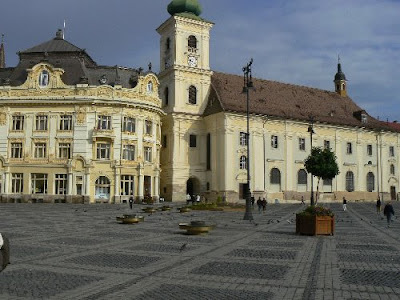 The city of Sibiu is one of the most important cities in Transylvania with a remarkable economic development potential, being also advantaged by its positioning on a traffic knot on the fourth Pan European Corridor and enjoying the benefits of an International Airport.The city is situated at 45°47' Nordic latitude and 24°05' eastern longitude. The altitude compared to the level of the sea varies between 415 meters in the Lower Town and 431 meters in the Upper Town. The city is situated in the temperate continental area, with temperature influences from the nearby mountains. The climate is thus temperate continental with no excesses. The annual average of precipitations is of 662 mm with the lowest values in the month of February (26.7 mm) and the maximum values in June (113 mm). The average annual temperature is of 8.9 Celsius degrees.With 155000 permanent inhabitants and 25000 temporary inhabitants, mainly students, Sibiu is the largest city in the county and one of the most important ones in Transylvania. The local community includes various ethnic groups. The great majority of the population is represented by Romanians (94%) who coexist with Germans, descendants of the Saxon colonists who emigrated in the 17th century from the region where Luxemburg is situated today. Hungarians, Roma and a very small Jewish community also coexist here, all of them contributing to the city life with their specific cultural influences.The same diversity also characterizes the religious life. Together with the Orthodox community, Reformed, Roman-Catholics and Greek Catholics live and practice their faith in Sibiu. The social structure of the city is based on the historical existence and multicultural life experience, the diversity of its inhabitants belonging to various ethnic groups, generations and life styles rendering the city a special aura. The municipality was not the only who prepared to receive its guests in the best possible conditions but the hotel owners too. The number of accommodations has doubled and the quality of services also increased considerably. At the beginning of 2008 a number o 72 accommodation facilities existed in Sibiu with services at the level of two, three, four and even five stars.The results are already visible. 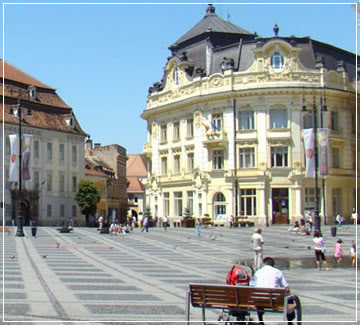 The specialized publications nominate Sibiu among the first cities in Romania where one would like to work. Others nominate our city among the first 50 touristic destinations which are worth being visited in 2007 or among the seven wonders of Romania. The tourism operators are more and more interested in the touristic offer of Sibiu. Local tourism operators are building a more and more professional local tourism network. The city looks better and better following the materialized investments and this development tendency is in a continuous growth. Known in German under the name Hermannstadt, Sibiu has always been the most important center of the German minority in Transylvania. Nowadays, Sibiu has the most numerous German community in Romania but also a fairly important Hungarian community. Still, Sibiu is a city with a predominant Romanian population (95% of the population is of Romanian origin) which knew how to preserve and mingle the 3 cultures to which the culture of other existing minorities was added.Legend has it that the lost children of Hamelin came out of the ‘Almasch’ caves (Varghis) in Transilvania, somewhere near the nowadays location of Sibiu. This is the romanticized explanation of a unique phenomenon which explains the appearance of a blond-haired blue-eyed people on these lands, who spoke German and lived by the customs of peoples living thousands of kilometers away. In effect, the fortresses and fortified villages in Transylvania were founded in the 12th century by immigrants coming from the Moselle valley area, known under the name of Saxons. The first documentary mentioning referring to the Sibiu area dates back from 1191, when Pope Celestine III confirmed the existence of the free prepositure of the Germans in Transylvania, the prepositure having its headquarters in Sibiu, named Cibinium at that time.Brought here by the Hungarian kings, the Saxons were granted numerous rights and benefits in exchange for their help in defending the lands against the attacks of the Tatars and Turks. They created ‘the land of the 7 fortresses’, 7 fortified cities, as well as numerous villages in which fortified churches were erected to serve as a shelter in the event of an attack.At the beginning of the 20th century, Sibiu is a vibrant city, tuned to the realities of its time, the third city in the Austro-Hungarian Empire using the electric lighting system and the second city in which the electric tram is produced. The first cinema house opens in 1909 and the first public toilets appear in 1910.The name of the city is officially changed into Sibiu in 1919, and the streets received Romanian names as well. In 1945, after the Second World War, the deportation of the Germans to USSR began. A number of 2800 persons of German ethnicity were deported, many of them never to return. With but a few exceptions, the communist regime never tampered with the old city, and Sibiu becomes in 1968, under the same name, the county residence. On December 21st, 1989 the anticommunist demonstrations begin in Sibiu and continue on December 22nd. Sibiu was the second city in the country after Timisoara to rise against the communist dictatorship.Nowadays, Sibiu presents itself as a true cultural and touristic capital of Romania, appealing to the tourists due to its medieval charm, due to the wonderful beauties of its surroundings, its local gastronomy and traditions and due to its charming natural landscape.